Fyfield Down, part of the Marlborough Downs in Wiltshire, is an example of chalk downland cut with a network of dry valleys, and has one of the best assemblages of sarsen stones in Britain. Sarsens (known locally as grey wethers because at a distance they can be mistaken for grazing sheep) are isolated blocks of sandstone silcrete believed to have formed 5-10 million years ago just beneath ground surface, as demonstrated by plant rootlet channels and silicified roots that can be found in many of the stones here. 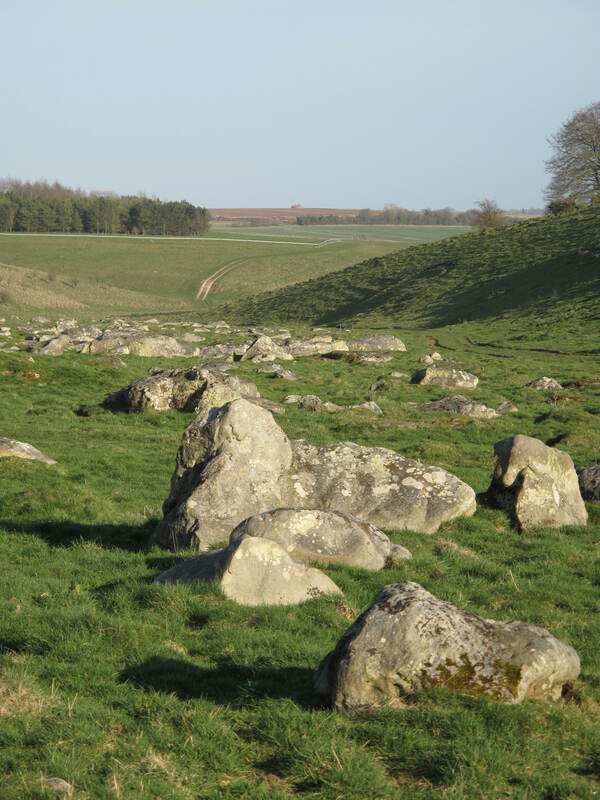 Sarsens have been used in buildings and monuments since the Neolithic period, such as at the nearby West Kennet Long Barrow and the standing stones at Avebury, but at Fyfield Down they can be seen in their thousands scattered over the hillside and in distinctive lateral valley trains formed under periglacial conditions. 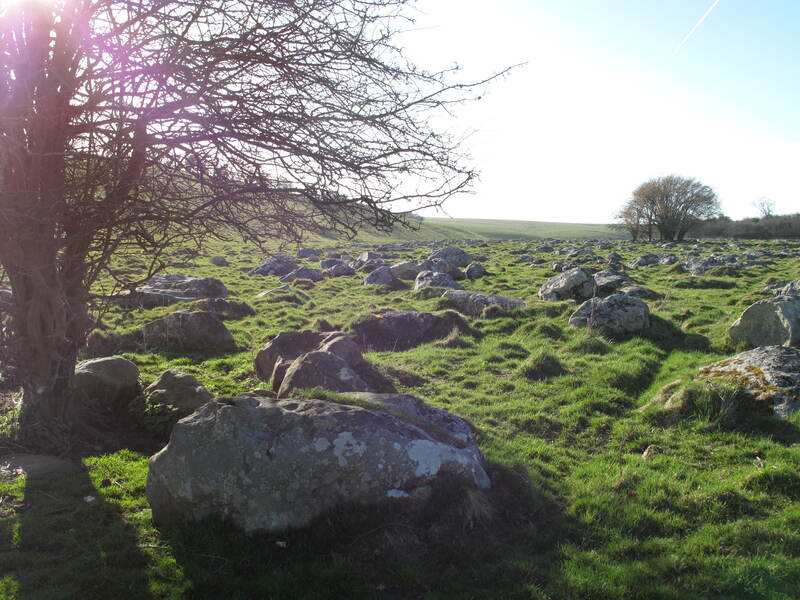 Fyfield Down also perfectly exemplifies the connectedness of geosphere and biosphere: besides the diverse flora and fauna that flourishes on the chalk downs, the sarsens themselves support a rich lichen flora, including Buellia saxorum which grows uniquely on sarsen stones. This may not be the most dramatic, jaw-dropping, soaring-mountain-top example of a geosite, but for me the shallow valleys of Fyfield Down and the human scale of the sarsens encapsulate that peculiar beauty of much of Britain’s geology, what I tend to think of as its warmth, its welcome, its homeliness, in the best sense of that word. Fyfield Down may not inspire the sublime spiritual awe celebrated by the Romantics, but in me it inspires something more important: it is a landscape that makes me want to settle in and stay. 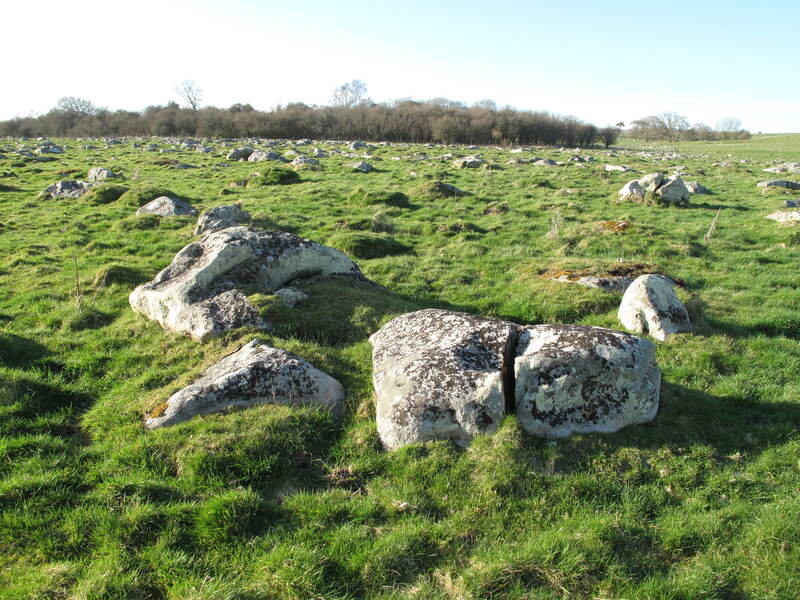 Tags: 100geosites, Fyfield Down, Sarsens, Wiltshire. Bookmark the permalink. Britain, in my honest opinion has many of the most beautiful geo-sites.